Recently, I have been reflecting on my experience doing creative activity and research. I have gained so many valuable things from writing and illustrating a comic book through an IDEA grant. I’ve built amazing relationships with mentors, I’ve gained technical skill, but most valuable of all, I’ve gained confidence that I want to pursue a career in narrative illustration. Research and creative activity can be a key to figuring out your aspirations and gaining direction. I knew when I started this project that there was a distinct possibility that I was not going to enjoy working independently on a comic book for a year. I had never worked on any project that long, let alone writing and illustrating a full book. However, I wanted to see if this career field was for me, and my research gave me an opportunity to test out this type of working situation while I had the guidance of the Office of Undergraduate Research and my mentors. If it turned out that I didn’t enjoy my project, I would still have had the support of everyone around me to modify the project or to simply push through until the end, rather than finding this out in the professional world and having no one to guide me through. Lucky for me, I loved the work and was able to learn so much about myself through the process. I’ve learned I’m comfortable working independently for long stretches of time and that I work well with the guidance of an art director, or in this case, my project mentor. That’s not to say I don’t have a lot to learn, because I do. One project has not made me an expert. However, working on this project has given me insight into my own abilities and interests, and has confirmed my long term goals. Additionally, this project has allowed me to build an extensive portfolio of original work that I can showcase. This is an important foundation on which I can build my illustration career. 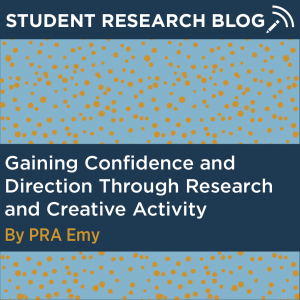 There are so many amazing things to gain from conducting research or participating in creative activity at the undergraduate level. In my opinion, one of the most important things is the insight you can gain into your personal and professional goals and interests. This insight can prepare you for graduate schools, professional life and can direct important undergraduate decisions like the topic of your senior project or an internship. It’s possible to learn all of this about yourself, and even more, by taking the leap into undergraduate research and creative activity. Emy is a senior majoring in studio art with a concentration in illustration. Click here to learn more about Emy.